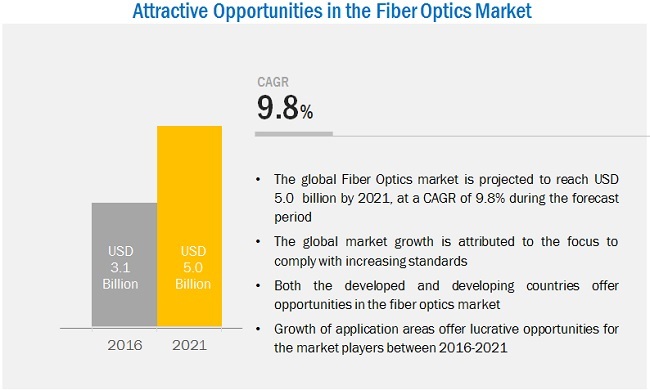 [137 Pages Report] The Global Fiber Optics Market is estimated to be valued at USD 2.85 billion in 2015 and is projected to reach USD 5.00 billion by 2021, at a CAGR of 9.8% from 2016 to 2021. Fiber optics is mostly used in various communications applications such as telecom, premises, utility, CATV, military, and industrial. Fiber optics have advantages such as increased bandwidth; electromagnetic interference immunity; decreased cost, size, and weight; low attenuation rate; electrical isolation; and data security. In this report, 2015 is considered the base year and the forecast period is from 2016 to 2021. The Internet is a global system of connected devices. Fiber optics acts as the backbone of the Internet, as optical fiber cable is used as the medium for transmitting information from one point to another. The International Telecommunication Union (ITU) estimated that, approximately, 40% of the global population had Internet connection in 2014, which is expected to reach 57% by 2019. The growing importance of cloud computing, data transfer & storage, and IoT is driving the use of Internet. The global cloud internet protocol (IP) traffic will grow by more than four times from 2014 to 2019 at a CAGR of 33%. Both the consumer and enterprise cloud usage will affect the Internet demand as more data and applications are allocated to the cloud. This research study involves the extensive use of secondary sources, directories, and databases (such as Hoovers, Bloomberg BusinessWeek, and Factiva) to identify and collect information useful for this technical, market-oriented, and commercial study of the fiber optics market. The primary sources mainly include several industry experts from core and related industries and preferred suppliers, manufacturers, distributors, service providers, and organizations related to all segments of the industry’s supply chain. After arriving at the overall market size, the total market has been split into several segments and subsegments. The figure below illustrates the breakdown of the primary interviews based on company type, designation, and region conducted during the research study. The value chain for the market consist of various stages such as raw material procurement, manufacturers, distributors, and end users. In fiber optics, quality control is important while manufacturing optical fiber cable as it helps in minimizing the degree of attenuation. Quality control begins from the sourcing of raw materials for substrate rods, chemical reactants, and fiber coatings. Automation is necessary in the manufacturing process to manage high temperature and high pressure to enable the maintenance of quality. Therefore, the manufacturing process adds maximum value in the fiber optics market because quality control while fiber drawing fiber from preforms defines the degree of attenuation and thereby the quality and price of fiber. In august 2016, Sumitomo Electric Industries (SEI) launched a new series of ultra-high fiber count to meet the demand from data centers. In March 2016, Sumitomo Electric Industries (SEI) introduced a multi-core optical fiber for applications in ultra-long-haul transmissions. In June 2016, Corning Inc. acquired Alliance Fiber Optic Products Inc. (U.S.) to strengthen its growth in data centers and FTTH applications. This report categorizes the global fiber optics market based on cable type, optical fiber type, application, and region. What are new geographical area fiber optics companies are exploring? The fiber optics market is expected to grow from USD 3.13 billion in 2016 to USD 5.00 billion by 2021 at a CAGR of 9.8% from 2016 to 2021. The growing importance of cloud computing, data transfer & storage, and IoT is driving the use of Internet, which is driving the fiber optics market, as it acts as the backbone for data transmission. The demand for the Internet is also driven by several other factors such as increase in the number of connected devices in homes, increase in the demand for Over-The-Top (OTT) video content, and the increasing Internet access. All these factors have led to an increase in Internet users, which in turn has led to the higher usage of optical fiber cable to transfer information over the Internet, thus driving the fiber optics market. Fiber optics is the technology used to transmit information from one source to another. Information is transmitted either through glass or plastics optical fibers of different diameters. The superior properties of fiber optics, such as higher bandwidth, higher speed, and a lesser degree of attenuation than copper cable, make it a preferred material for use in various applications. Fiber optics is used in various communications and non-communications applications such as telecom, premises, CATV, and sensors. On the basis of cable type, the market for the single cable type is expected to grow at a high growth rate from 2016 to 2021. The next generation of high bandwidth requiring applications, along with the proliferation of connected devices, is expected to require faster and higher bandwidth networks which will require the use of multi-mode cable for data transfer. This growth in the FTTX networks will in turn is expected to drive its market. On the basis of optical fiber type, the market for glass optical fiber is expected to grow at a high rate from 2016 to 2021. Advantages such as greater bandwidth; immunity to interference from vibrations & electricity; and the light weight are expected to drive its market in applications such as telecom and CATV which require mechanical protection against stress. The Middle Eastern & African region is projected to grow at the highest rate in the fiber optics market from 2016 to 2021. The factors contributing to the market growth in the Middle East & Africa are the rise in demand for the Internet from emerging countries, increased industrialization, and the growing telecom industry. 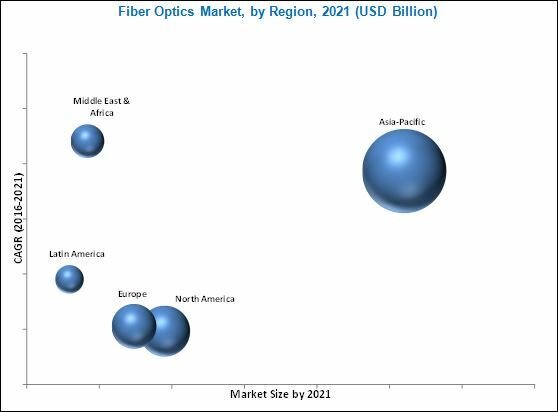 The fiber optics market in Europe and North America is consolidated, whereas the market in the Asia-Pacific has a fragmented structure, where China, Japan, India and Australia have high potential in the fiber optics market. In the communications application, fiber optics is responsible for data transportation from one source to another. It is further sub-segmented into seven types, namely, telecom, premises, utility, CATV, industrial, military, and others–which include security and metropolitan. The telecom application is expected to account for the largest market share in the fiber optics market. It is used for various purposes such as point-to-point communication, entertainment, delivery, and access to Internet-enabled services, critical communication, news & infotainment, among others. The non-communication applications of fiber optics are sensors and fiber optic lighting. Sensors measure a physical quantity based on its modulation on the intensity, spectrum, phase or polarization of light traveling through an optical cable. The usage of fiber optics in sensors offers many advantages such as lightweight, high sensitivity, multiplexing capability to form networks, and immunity to electromagnetic interference. What are the advances in technology or upcoming technology for fiber optics? The major restraint in the fiber optics market is the growing use of wireless communications systems in remote areas. Mergers & acquisitions and new product launches are the most preferred strategies adopted by the key market players to sustain in this highly competitive market. Major opportunities for the market are the advances in technologies in order to increase the data transmission rate and factors & trends defining the telecommunications industry in the Middle East & Africa. The fiber optics market is projected to growth at a high rate from 2016 to 2021. The major players in this market include Corning Inc. (U.S.), Prysmian Group (Italy), AFL Global (U.S.), Finisar (U.S.), Leoni AG (Germany), Furukawa Electric (Japan), LS Cable & System (South Korea), General Cable Corporation (U.S.), and Finolex (India), among others.